On the weekend of May 7 and 8 the Backpacker's Club AGM and Dales Outdoor Weekend ihttp://www.blogger.com/img/blank.gifs taking place in Stanhope, Country Durham. The event will have lightweight equipment displays and a book fair at which I'll be signing copies of my Scotland book.http://www.blogger.com/img/blank.gif I went to the last big Backpackers Club event like this held in Bellingham in Northumberland in 2007 and it was a really enjoyable weekend. Like Bellingham Stanhope is in a lovely area with plenty of opportunties for walks and cycle rides - an ideal place for an outdoor event rather than the urban exhibition halls in which they are too often held. This is a great opportunity to meet like-minded people and look at interesting gear and visit some lovely countryside. I hope to meet many of you there. More info from event@dalesoutdoorweekend.com and the Backpackers Club, where there is a link to a poster about the event. The pictures were taken at the Bellingham weekend. Recently I was privileged to have a first look at a revolutionary new ultralight pack design from long distance backpacker Colin Ibbotson (who I have written about before - see Ultralight in the Cairngorms). Having had the design explained to me by Colin, examined the different styles and tried a model on day hikes and an overnight trip I've written a piece that is now on the TGO website here. These packs really are different and look like being the most comfortable ultralight packs available. The picture shows the Dyneema version, which is the one I have been testing. A sudden opportunity for an overnight trip combined with fine weather and a good forecast saw me hastily packing gear and heading for the Cairngorms late in the afternoon. As I climbed up to the Cairngorm Plateau the shadows were lengthening and the low sun was highlighting the cliffs, making the always dramatic rocks look more jagged and splintered than usual. Once on the tops the stones were glowing gold, the snowfields shining white and the darkening blue sky streaked with fine tendrils and smears of cloud. There was no wind and the air was warm. The last few day walkers started their descent and I was alone, in sole possession of the vastness and space. Dodging round the soft and slippery snowfields I took a circuitous route to the heart of the Plateau where I camped beside a still half-frozen lochan, settling into the tent just as darkness fell. Then as I lay looking out at the silent hills the sky started to brighten again with a yellowish hue on the clouds and a pale grey-blue cast on the snow. A sharp curve of light edged the clouds and slowly an almost-full moon rose over a distant ridge. As the moon crept up the sky I fell asleep to be woken hours later by a restless wind rustling the tent and blowing cold damp air over my face. Zipping up the tent door shut out the breeze and I was soon snuggling deep in my sleeping bag and sinking back into sleep. Waking again to the very different pale grey of dawn I looked out to see clouds covering the summits. The temperature was not far above freezing and the wind, sweeping over the snow, was chilly. Coffee and muesli set me up for the morning and I was soon climbing the snowfields to Ben Macdui. The summit was cloud free but there was little in the way of views as all around the clouds swirled and surged. Then as I returned across the plateau the clouds began to dissolve, revealing summits and snowfields. A great sweep of shattered blocks and cracked slabs of snow marked avalanches on the Great Slab in Coire an Lochain. The burns running out of the corries were heavy with snowmelt, taking away the last of the winter. Twenty hours after it began my trip was over, a short but intense immersion into the wild world of the Cairngorms, a familiar landscape but one that never fails to impress with its power and beauty. Evening light on the Cairngorm Plateau, April 17. Early morning at the Lochan Buidhe Camp, April 18. Across Lochan Buidhe to Cairn Gorm as the clouds clear, April 18. The return of the iconic ospreys to their nest at Loch Garten in Abernethy Forest is an event I look forward to every year and I always go to see them soon after their arrival. For me they are a symbol of wild nature and a signifier of the coming of spring. Hearing that both birds were back (the RSPB reports in detail with http://www.blogger.com/img/blank.gifa daily blog and live videocams here) my partner and I headed for Loch Garten on a day of warm breezes, cloudy skies and touches of sunshine. Sometimes both birds are away from the nest before eggs are laid and sometimes one is there but low down in the big bundle of sticks. There can be a long wait to see the birds. Today we were in luck and arrived to find the female, EJ, on the nest and the male, Odin, perched on a branch just below eating a fish EJ had brought for him (a rare event as usually the male brings fish for the female). They both looked magnificent, birds of prey in their prime. After viewing the ospreys from the RSPB hide we had a quiet wander through the pine forest along the edge of Loch Garten and then onto Loch Mallachie. Two red squirrels entertained us chasing each other in and out of the branches of a big pine, stopping occasionally to watch us warily. Their reddish fur and the reddish coloured tree were well-matched, both catching bursts of sunlight. Out on Loch Garten we could see distant flocks of ducks, small black bobbing dots on the water too far away to be identified. Then in a calm bay, where water lilies appear later in the year, a few came close to shore – beautiful goldeneye with their distinctive plumage and ringed eyes. In a flooded marshy area in the trees two mallard paddled. Out on the main body of the loch the breeze rippled the water and the reflections of the clouds shimmered. Beyond the water and the forest the hills rose, dark against the sky as most of the snow has gone. The forest was calm and quiet, with just the gentle rustle of the wind in the tree tops and the occasional calls of woodland birds. In the distance came the soft murmur of doves. Just once a loud “chrr” broke the peace, a great spotted woodpecker warning of our presence. The forest floor was starting to green over with bilberry bushes and other low shrubs. Soon there will be flowers and more colour. The photo shows Loch Garten, April 8, 2011. 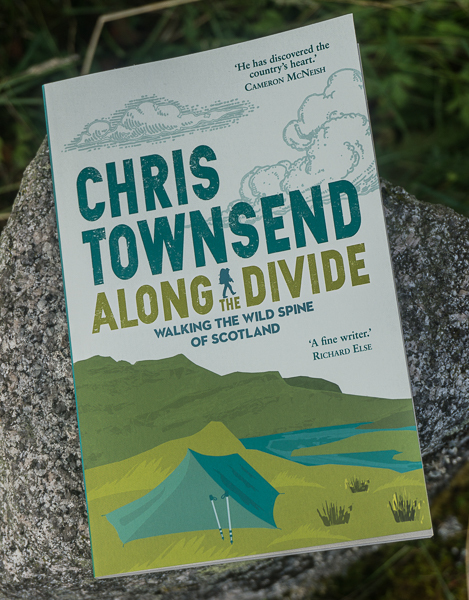 On April 16 I'll be at Hilltrek in Aboyne on Deeside to sign copies of my book on the Scottish mountains and chat to anyone who wants to come in for a blether. If you're in the area do pop in and say hello and have a look round Hilltrek's shop. Hilltrek is an outdoor clothing company that makes (and that is "makes" not "imports" - an actual manufacturer) garments suitable for Scottish hill weather from fabrics like Ventile and Nikwax Analogy and also sells Paramo clothing. "Scotland" has also received another positive review, this time on the website Undiscovered Scotland, which can be found here. The photo shows Loch Coruisk and the Cuillin, a wild scene on a wild day. Since my post about wild land and the Scottish elections on March 25 the debate has moved on. 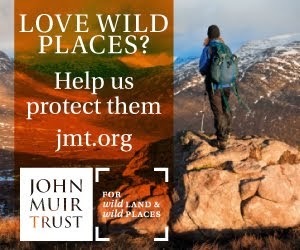 The Mountaineering Council of Scotland has put out a press release calling for politicians to protect wild land, with the proposed Allt Duine wind farm on the edge of the Cairngorms National Park given as an example of a development too far (Alan Sloman has a good piece on his blog about this - Allt Duinne: The Big Lie). The MCoS press release has resulted in publicity in a variety of places including the Press and Journal newspaper and the Walk Highlands and Grough websites. It's important for those of us who care about Scotland's landscape and natural environment to continue talking about these issues and emphasising how precious our wild land is and how it must be protected. And for those who haven't yet to write to election candidates and ask them whether they'll work for wild land (I haven't yet had any replies to my emails). The photo is from my unfortunately growing collection of pictures of wind turbines in the Scottish hills. I'm showing these pictures at a meeting on wind farms and the election in Inverness on April 6. With strong winds, heavy rain and a slight chance of thunder and lightning forecast I decided a planned overnight in the hills could wait and I’d spend a few hours wandering the local hills and woods instead. Last time I walked this ground there was still much snow and winter held the land tight and hard. Now I expected there to be at least a few signs of spring. At a glance there were none with deciduous trees still bare of leaves and open ground shades of faded brown with no hint of green. From a distance the birches still had that hazy winter sheen that varies from faint violet through purple to, rarely, a quite bright orange, depending on the light. However a close examination of the twigs revealed tiny tips of green on the brown buds, the first tentative push of the new leaves in search of sunlight. And in the ditches and pools and even the puddles on the tracks the frogs had been busy, leaving vast swollen clusters of frogspawn, each globule of jelly with its tiny dark spot that signified new life. Out of the trees the wind was strong even in the glen, the sky a mobile mass of racing clouds, some white, some dark and heavy with rain. Brief showers fell then passed on with hints of rainbows in their wake. Amidst the wind and the clouds I could see dark shapes wheeling and turning in the air. Soon I heard them. Lapwings, returning with the spring to the wet pastures where they nest. Then came another wilder call, the descending bubbling song of the curlew, always a thrilling sound and another that tells of the changing seasons. Leaving the glen I climbed a boggy track through heather towards the highest hill in the area, 549 metre Carn na Loine. I had set out with no fixed plan, my intention just to wander and follow my instincts but I had wondered whether I would go this way earlier and the thought must have directed my feet because although I took a roundabout route and approached the hill from the far side I knew I would continue to the summit. Carn na Loine isn’t a distinctive hill, just the highest of a series of rounded heathery bumps, but it is an excellent viewpoint with a sweeping panorama of the Cairngorms and Strathspey. The high mountains to the south were appearing and disappearing in the clouds as squalls blasted over them. Although still snowy, large dark patches were appearing though I doubted there was any thawing today as the wind was bitter on Carn na Loine and I needed hat and gloves and a zipped up jacket. There was no hint of spring up here. On the descent though I put up a mountain hare, which sprang from almost under my feet and raced up the hillside, tripping and somersaulting at one point, though this barely slowed it down. The hare was rather ragged in appearance, a mix of grey, brown and white as its pale winter coat was being shed. I returned home in the dusk, the air chill and the sky darkening. I had thought there might be a coloured sunset but the clouds were too thick and the day faded away gently into greyness. For the first time I feel the winter is over. There may be more snow and more frosts but the spring has begun. The photo shows Strathspey and the high Cairngorms. The latest TGO (May issue) is in the shops now. The theme of my writing is rain with my backpacking column about hiking and camping in wet and stormy weather and my gear review a comparison of 15 lightweight waterproof jackets. Elsewhere in gear John Manning reviews 15 pairs of summer walking trousers and Cameron McNeish likes the lightweight GoLite down-filled Demaree Canyon jacket. The rest of the magazine looks interesting, though I haven't had a chance to read much of it yet. Cameron McNeish enthuses over spring bird life in the hills and visits Malham Cove and the Yorkshire Dales, Roger Smith despairs of politicians' ignorance of and lack of interest in the environment, Carey Davies interviews comedian and activist Mark Steel about his walk along Israel's West Bank, Ed Douglas explores the Cambrian Mountains - another area threatened by wind farms, Tony Howard describes a trip to the mountains of Montenegro, Roly Smith looks at the past and future of the Peak District as the National Park celebrates its 60th anniversary and several authors describe Scotland's splendid islands in a special section. One feature I have read is Jim Perrin's "A New Covenant for the Land", about his beloved Pumlumon in Wales and the threat there of ever increasing numbers of wind turbines. This is an excellent piece - passionate and intelligent - with echoes of Aldo Leopold's land ethic when Jim writes "the fundamental unit of eco-consciousness is respect for the land in all its resonance and character". Jim says it is time for a "new covenant to protect our land". 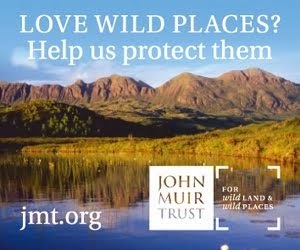 I agree and would link this with the http://www.blogger.com/img/blank.gifJohn Muir Trust's Wild Land Campaign. 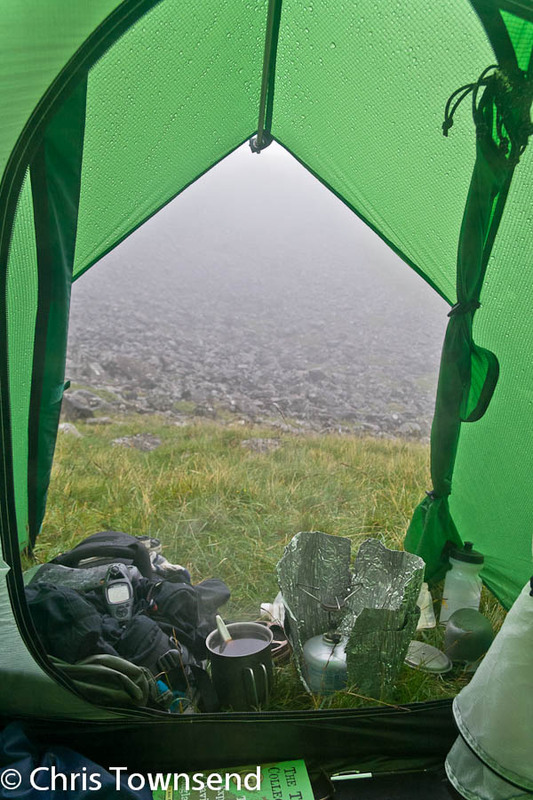 The photo was taken at a wild camp high in the hills of the island of Rum as I was relaxing in the comfort of the tent with a hot drink and a book looking out at the rain and mist that had accompanied me all day.